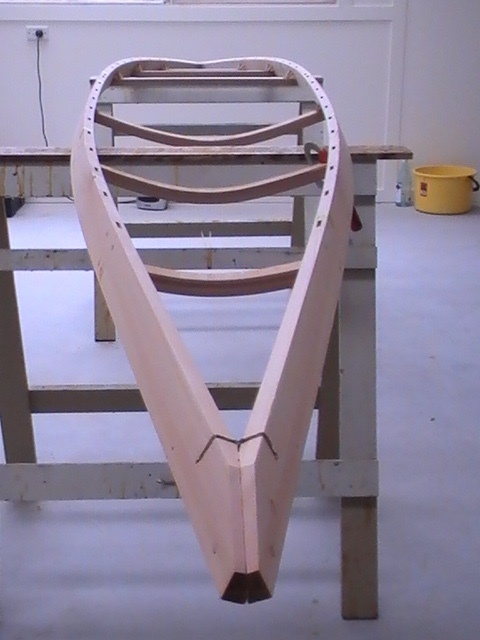 It’s day 1 of a 5 day workshop I’m undertaking, my purpose: to build a skin on frame ( SOF) kayak, a modern day interpretation of the Inuit’s primary vehicle. I arrive at 8.30 to meet my traveling companions for this journey. 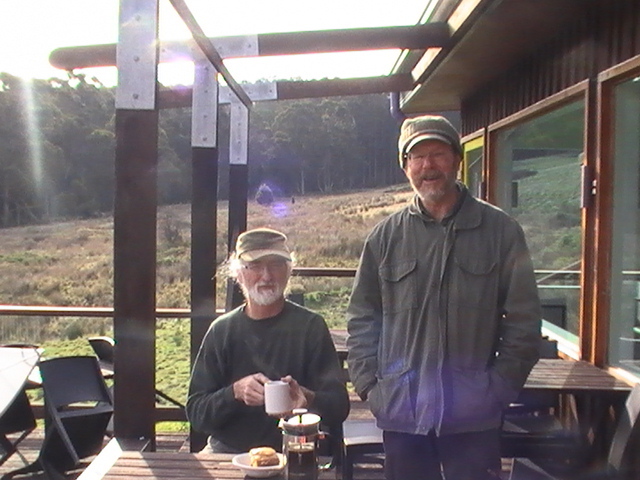 There’s David – the visionary host who runs Forestvale Design Centre on South Bruny Island and Peter Ingram Jones – who I come to know as the quiet encouraging merlin. That’s David on the right. 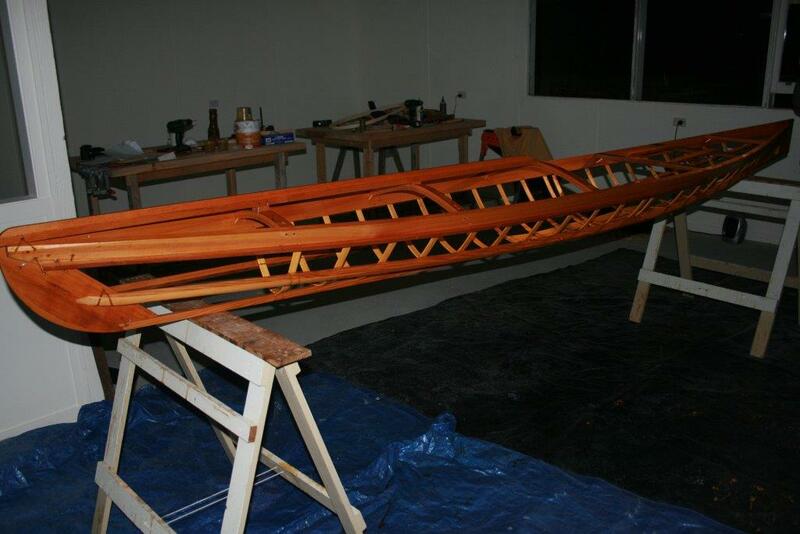 We start with some easy conversations about what brings me to build this kayak, so David leaves Peter and me to start to get to know each other and work together. I’m pretty excited at this point…an enthusiastic squire. During day 1, I’m putting the deck together. 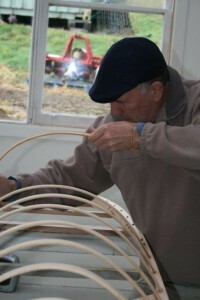 Peter has done some prep work in getting the gunwales, cockpit coaming and bamboo ribs ready for the build, but he quickly learns it’s been a while since I last did much wood work. He gets me to cut the angle on the front and rear of the gunwales with his new japanese pull saw. 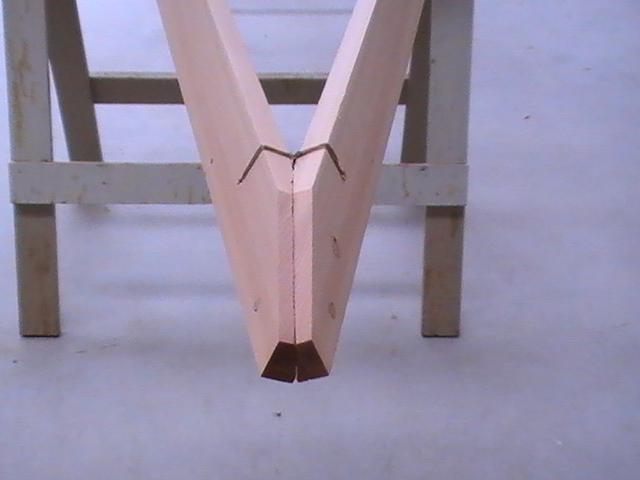 I realise these things work really well… a lot better than my old tenon saw… so we’re off to a good start. We spread the gunwales and attach the deck beams. So now we’re starting to see some progress and the deck takes shape pretty quickly. 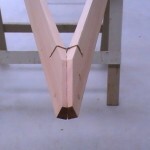 All joints are doweled so I’m cutting, drilling and inserting dowels and adding lashings. 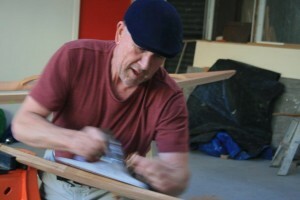 We finish on the deck and I set out to start work on the greenland paddle. 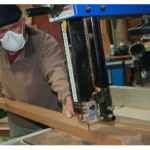 Now I haven’t touched a bandsaw since wood work in year 9 and I’ve never thought bandsaws and humans were close friends, never the less I take to the bandsaw and soon I have the paddle blank cut out…. and all fingers still in tact. 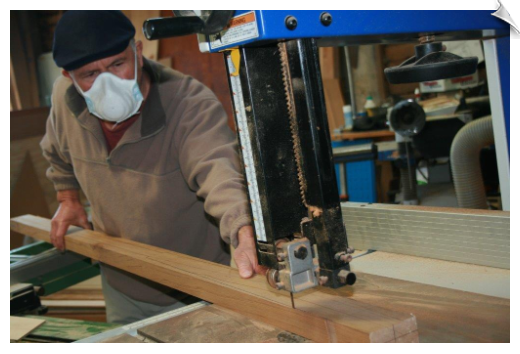 Then it’s on to planing and shaping the blade… nice workout if you want it as well.. There comes a moment when you haven’t worked with tools like these for a while when you start to remember the touch and feel of the wood and the tools. 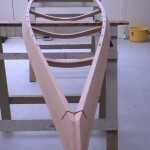 I start to hear that familiar “whoosh” sound as the blade of the jack plane runs over the surface of the forming paddle, taking off curls of western red cedar and I start to reconnect with those lost lessons of dec ades gone past…. not too much wrist… let the plane do the work. This is very satisfying to be doing. I finish Day 1 with a big smile on my face and a real excitement for what Day 2 is going to bring. Bern and I retire to our hideaway cabin and cook a simple meal… it tastes great. 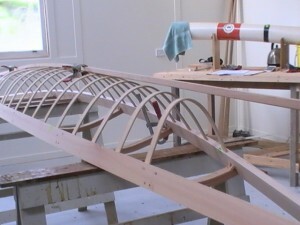 Day 2 is about shaping the hull and bringing the deck together to complete the frame of the kayak. Now I’ve never steamed wood before, so Peter introduced me to his compact steaming device…. 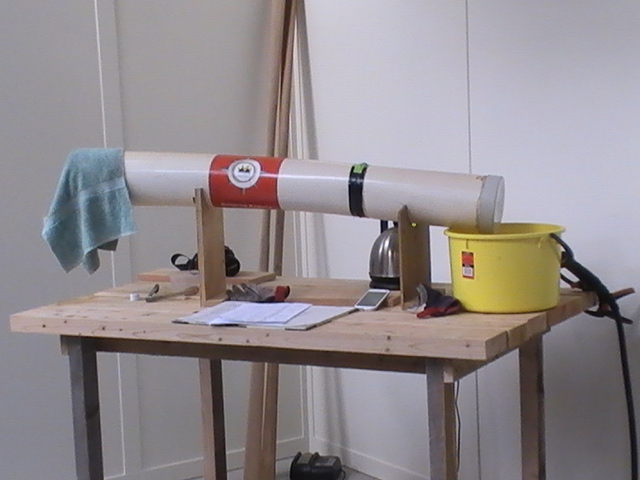 a 1 mtr long piece of plastic water pipe connected to his kettle…. so this is what steaming is about. We’ve soaked the bamboo ribs overnight after cutting them to size so now we set up the steaming schedule and introduce the ribs two at a time into the steamer, then after the required time…. somewhere between 3 and 5 minutes, we remove and fit into the mortices prepared for them and flatten and shape to fill out the hull shape. Here’s a shot of the steaming process…. I have to admit, I was a little nervous at this point… so I know life is a do over and you can simply cut other timber and re steam if it doesn’t work… or you break one in the process ( yep we broke several)…but when you’ve risked 3rd degree burns in the first place taking wood out of a kettle, it’s good to set the shape up nicely. Eventually you get them set up well and something like the following is starting to happen…. hey this is starting to look like a kayak frame. 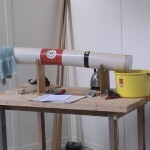 I’ll update you as to days 3 and 4 in my next post, but I thought I’d bash on a bit about experiential learning and the link to this wonderful craft that’s taking shape before your eyes in this post… and in real life as it happened. Now, many folk have written about experiential learning over the years. Kolb speaks about the “learn by doing” followed by “reflecting”, “theorising” and then “planning” cycles within learning that go beyond classroom type activities. Don Schon, recently deceased organisational developer, spoke about the value of reflection on our experiences as the cornerstone of learning – so thinking about our experiences before, during and after the experience. What I found I was “doing” over the 4/5 days of working with Peter and David is the kind of experience that many people are craving for these days. It doesn’t have to be building a kayak, but it does have to have the elements I’ve outlined above. We live in a world that for many of us has layers of insulation around us and between the context and environment we live in… this is true of the natural environment as well as the built or business environment. We’ve increasingly created technologies that create conflicts for us and contribute to this insulation. We can become insulated from ourselves, others and the world of meaning. They get in the way at times of living and experiencing life. On the one hand, the technologies are designed to create efficiency and allow us “time” to devote to more higher order “thinking” endeavours… or give us ways of using “time” better ( against some standard generally). On the other hand they have the potential to dumb us down and have a narcotic effect on our senses… we just expect that new gadgets / technology will work and don’t question our assumptions behind how we work or our behaviours. When we get out from behind the insulation we start to experience life as it is, directly, somewhat beyond categorising initially but not through the padding. This may be a bit disconcerting to begin with as we start to relearn what our senses are telling us. We may start to see things differently, food may take on a whole new sensation, relationships may become more vital and alive, work may become more sensate and appreciated. Now please don’t misread this – I’m not suggesting a return to pre-agricultural times, but there are a number of examples of this “reaction” against the things that have contributed to our insulated lives. We’ve seen a resurgence in “vinyl records and turntables” which seem at odds with the highly sophisticated way digital technologies can reproduce sound. A number of inner city redevelopment projects around the world have seen a remarkable uptake of small niche craft oriented businesses – which seems to be against the flow of “bigger is better” in business. The largest growing sector for entertainment outside of music and video sales is in the selling of “experiences” – holidays, activities, learning crafts ….are all becoming hip right now. The internet has been a wonderful way of connecting with ideas and people, etc, but it has also meant a reduction in many cases of our willingness to engage directly with others – we can sit behind our computer desk and remain somewhat anonymous. We can create an online persona which may be unconnected with how we are when we meet people “belly to belly”. Many things flow from our experiences. They give us clues to our identity, where we’ve come from, the values that have shaped us, the kinds of cultures that we’ve created in our families. Experiential learning, I’m reflecting on since my wonderful 5 days with Peter and David is much more than just a style of facilitation or workshop, it’s about how I create meaning for myself in my work and life. Getting involved with the kayak encourages me to go deeper into the Inuit tradition. I find myself browsing for more information on their way of life. As I do this I connect up more with the lives of my grandparents and their odyssey to come to Australia from Greece over 100 years ago. I hold the felt experience of that jack plane in my hands moving along the emerging paddle blade in my being and this experience shapes me in life.